The Toronto International Film Festival (TIFF) opens later, with tennis drama Borg McEnroe kicking things off. More than 250 films will screen at the 11-day event in Canada's largest city. 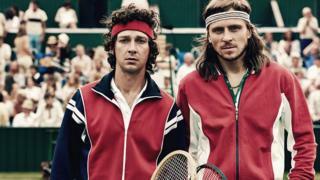 The festival's opening film sees Shia LaBeouf and Sverrir Gudnason play Bjorn Borg and John McEnroe, recreating their famous meeting in the 1980 men's final at Wimbledon. Many films shown at TIFF, now in its 42nd year, traditionally go on to Oscars success. Unlike many film festivals, Toronto does not appoint a jury to score the films or give prizes. Instead it asks audience members to name a "People's Choice" in a public ballot. Previous winners include Slumdog Millionaire, Room, 12 Years a Slave, The King's Speech, Silver Linings Playbook and La La Land. Given the awards success many of those films went on to have, it's understandable why Toronto is seen as such a good indicator of public reaction. This year a number of films are already attracting the attention of critics. Margot Robbie's turn as figure skater Tonya Harding in I, Tonya is set to be a highlight, as are Downsizing, which stars Matt Damon, and The Current War, which sees Benedict Cumberbatch play Thomas Edison. Borg McEnroe isn't the only sports-based film generating awards buzz, or even the only tennis-based film. Emma Stone's portrayal of Billie Jean King in Battle of the Sexes also considered a hot property this year.